The right body protection to wear for each risk-assessed task is of vital importance in every work situation, particularly in work environments where it can be fatal if we get it wrong. A huge number of people rely on protective clothing each day. For example, the coveralls, overalls or protective suits they wear are not just designed to protect a person’s own clothes and body, they can have other necessary functions such as keeping contaminants off the skin, resisting cuts and abrasions, providing warmth in cold conditions and keeping contamination out of products, such as in the food industry. All protective clothing is a compromise between comfort and protection. Shorts and a shirt may feel good, but if you wear them in an icy blizzard, you may be in grave danger of freezing to death. Coveralls can save lives and an employer must provide suitable protection from the relevant work hazards that can’t be eliminated, isolated or reduced to safe levels. Such hazards may include sparks and hot particles, molten metal splashes, direct flame, radiant heat, solvents, acids, alkalis, oil, grease, blood and body fluids, asbestos fibres and other substances. European standards have defined different levels of protection in terms of ‘Types’. Types relate to different groups of applications with similar properties; for example, whether they involve protection against dusts, liquids or gases, and whether the liquid is in a strong spray or light splash form. The standards identify six Types to cover all eventualities - Type 1, Type 2 and so on down to Type 6. In general terms Type 6 is the lowest protection level, namely ‘reduced liquid spray protection’. A classic Type 6 application might be paint spraying, although not necessarily always, because of course there are so many variables in any individual application you care to name that it is difficult to be definite and specific about the parameters of any application. Hence all protective clothing recommendations come with a disclaimer stating that it is the user’s final responsibility to ensure the garment is suitable for the application. Type 1 is the highest level protection, being ‘gas tight’, fully encapsulating suits which are completely sealed against the environment. Type 2 is a similar construction but defined as ‘non-gas tight’, and requiring a positive pressure to be maintained inside the suit by means of pumping air into it. In between the two extremes are various levels of liquid protection - relating generally to the spray intensity and volume of liquid. The odd one out is protection against hazardous dry particles (that’s dust) and is defined as Type 5. These specified types of protection - Types 1 to 6, are all defined as ‘Class 3’ products in the overall classification for all Personal Protective Equipment (PPE). As we saw above, for protective clothing the highest number (Type 6) is the lowest level of protection and the lowest number (Type 1) is the highest.However, in the higher overall classification, Class 3, the highest number is the highest level of protection and describes Complex products while Class 1 - ‘Simple’ products, relates to PPE not designed to protect against hazards. This does not make sense as if it does not protect against hazards, why have it and how is it PPE? Class 1 is for coveralls worn by people not working with substances such as hazardous chemicals, but needing to protect their own clothes against getting dirty, for example, or wear a hat for harnessing loose hair to prevent entanglement in machinery. The lowest number here reflects the lowest level of protection. Bizarrely, it is worth mentioning that the classification of individual fabric properties of garments - things such as tensile strength, puncture resistance or chemical permeation - reverses the numbering system again so that the highest ‘class’ is the highest protection level. The garments most commonly used are those for Types 5 and 6 applications, and here the holes created by stitched seams are not in most cases critical, although the relative weakness of disposable materials means that poorly sized and/or poorly designed garments can result in problems when resultant stress on the seams opens up stitch holes, allowing ingress of harmful dusts or liquids. This is something users should bear in mind when considering very low priced garments. The major cost component of a disposable coverall is the fabric, and low prices are too often achieved simply by making the garment smaller and using less fabric. This can be an issue of safety as well as of comfort and durability. To allow the right type of clothing to be chosen, all the various hazards in the workplace need to be carefully considered and risk assessed. This will enable the employer to assess which types of workwear are suitable to protect against the identified hazards, and for the job to be done safely, yet efficiently. All reputable PPE suppliers will gladly assist in advising on the most suitable form of protection to remove or reduce workplace hazards. It may be necessary in a few particularly difficult cases to obtain advice from specialist sources, or even from the PPE manufacturer. What should we consider when assessing the suitability of protective coveralls? 1. Is the material appropriate for the risks involved and the conditions at the place where exposure to the risk may occur? 2. Does it fit the wearer correctly? Remember, we are all different in shape, size and personal preference. 3. What are the needs of the job and the demands it places on the wearer? For example, the length of time the PPE needs to be worn, the physical effort required to do the job and the requirements for visibility and communication. 4. Has the state of health of the person wearing it been taken into account? For example, does the user have a pre-existing health problem which might make wearing it difficult? 5. If more than one item of PPE is being worn, are they compatible? For example, will a respirator fit over other protective equipment and garments chosen? 6. Hazards for the whole body include temperature extremes, chemical or molten metal splash, spray from pressure leaks or spray guns, impact or penetration, contaminated dust, excessive wear or entanglement of own clothing, all of which need to be borne in mind. 7. Options of body protection can include conventional or disposable coveralls, boiler suits, specialist clothing such as chain-mail aprons for a butcher, or high-visibility clothing for a construction or rail worker. 8. Working with chemicals in any environment can be dangerous and it is a subject which needs to be examined thoroughly through a rigorous risk assessment process. However, with the adequate assessment, protection and planning they needn’t be a risk to employee safety. You must be aware of the specific chemical properties and dangers to successfully consider the proper safety clothing required in the circumstances. Do you need protection against skin contact or inhalation? Do you face danger of ingestion of a chemical substance? Is frostbite from very low temperature chemicals a threat? The employee working with particular chemicals might need a disposable suit, disposable overshoes and an effective respirator. Head protection in a chemical threat environment might be a covering disposable hood. The key consideration with chemical protective clothing is to correctly identify the threats you face. Medical environments are very different from manufacturing workplaces. The general hazards might all be of a chemical nature, but the specific dangers are often very different. Do your research, talk with other professionals in your industry and workplace, identify the best protective gear, and ensure it is maintained and looked after well. Fabrics and coveralls should protect workers against short term contact with flames, convective heat, radiant heat as well as the harmful effects of metal splashes. Below is a list of the various sources of guidance for just this one aspect, (fire resistance/retardance), of PPE specification. Despite huge technological advances in PPE, the invention of supposedly much more ‘user-friendly’ materials, and the introduction of increasingly stringent health and safety legislation, construction still has the highest number of fatal injuries across all the main industry groups. Research carried out recently by a large company in the UK found that some construction site workers continue to have a rather cavalier attitude towards protective clothing, but even more worryingly, that within some elements of the industry, little was being done in terms of training or education to rectify this situation. Much of the harm and injury that affects construction workers does so to those employed on smaller projects, and usually from smaller companies. Some health and safety managers interviewed during the study admitted to a lack of knowledge? about different PPE product specifications, and which clothing would be most suitable for their workplace, while they also had concerns about how to deal with unknown or unpredictable hazards. Workers also acknowledged their biggest issues with PPE were to do with comfort and performance. Three quarters said that if workwear was more comfortable, they would be more willing to wear it than is currently the case. Many jobs require workwear that provides protection against a combination of these hazards, such as the emergency services. And as well as the basic 89/656/EEC Directive, depending on the circumstances, other safety standards may also need to be considered. For example, high visibility clothing should adhere to EN 471; workwear to protect against heat and flames should meet EN ISO 11612:2008, while for outside workers, such as builders, cleaners and gardeners, UV Standard 801 - the international test for protection against sunlight - should also be taken into account. We should ensure any PPE bought is suitable for both the hazard type and the extent of the hazard, with suitable standards in manufacturing demonstrated by being ‘CE’ marked, or bearing another international system of recognition, and complying with the requirements of the relevant national PPE regulations. In the absence of a specific local requirement, the UK Government Personal Protective Equipment Regulations 2002, offers an excellent start point for inclusion into your safety management system and PPE selection process. The CE or other marking signifies that the PPE satisfies certain basic safety requirements and in some cases will have been tested and certified by an independent body. When choosing which types of workwear are needed for a particular job or work environment, it is always advisable to work closely with various suppliers and manufacturers to ascertain which types of clothing, and which particular products, will be the most suitable. Make sure anyone using protective clothing is aware of why it is needed, when it is to be used, repaired or replaced - and its limitations. Train and instruct people how to use it properly and make sure they are doing so. Check regularly that protective workwear is being worn all the time workers are exposed to the risk, and never allow exemptions for those jobs which take ‘just a few minutes’. If PPE is not being worn, investigate fully the reasons why not. Provide facilities to keep clean clothing and dirty work clothing apart and check that workers use, clean and store it properly. Store protective clothing in a clean cupboard or locker and avoid contaminating the skin when taking it off. Never wash chemically contaminated protective coveralls at home. Check clothing for any damage before and after use. 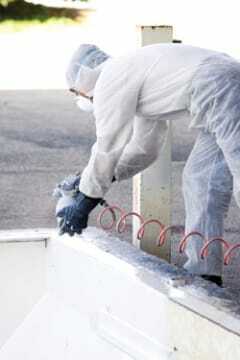 Use disposable coveralls only once and dispose of safely after use. Concerns for general worker safety, including protection from death and disabling injuries and illnesses, as well as protection from the specific threats of chemical agents and splashes, fire, and bullets, have resulted in an entire industry devoted to personal protective equipment. This equipment includes everything from chemical protective garments and suits to firefighters’ turnout gear, to industrial fire retardant garments, to bullet-resistant vests through to respirators. There are significant revisions and additions to many of the existing standards for worker protective clothing in the areas of chemical protection, fire protection, and bullet-resistant garments, and it is important for management to keep abreast of national laws and international best practice, for example EU regulations, if in the EEC, and those of the specific countries in which they operate. Pat McLoughlin is the director of British Safety Services (BSS), an international consultancy offering advice and training on health and safety issues. Established in 1990, BSS has gained an international reputation as a major provider of high quality safety training that gets results. The team at BSS also provides guidance on all aspects of public safety, specialising in workplace legislation and best practice. Clients include, Qatar Petroleum, Al Futtaim Carillion, Readymix Qatar, PDO, Sabic, Conoco Phillips, Canadian Nexan, Weatherford, Inpex Libya, Al Mansoori, Petro Bras and Misco Libya.